This is supposed to work really well for Poison Ivy. It also helps relieve bee and wasp stings and mosquito bites. If you start to develop areas of irritation from Poison Ivy, gently rub the liquid from the plant on the areas. It's said to even prevent the rash from appearing if you use this on exposed areas beforehand. I have never had a Poison Ivy reaction, so I can't tell you how well it works myself. If you have tried this, let me know. This is one of those "nice to know" things in case you are out hiking and realize you just got yourself into a patch of Poison Ivy. It actually contains active ingredients found in Preparation H., fungicide and anti-inflammatory. 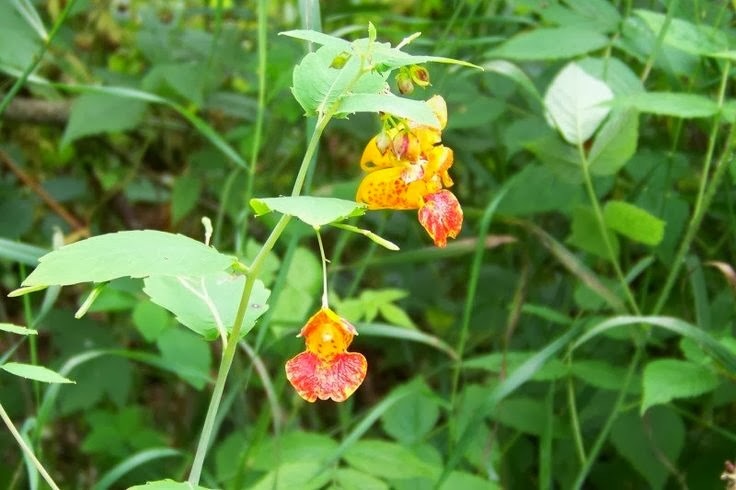 His article also says "There are many ways to capture Jewelweed's medicinal properties: The fresh plant lasts a week in a sealed container in the refrigerator. 1960s foraging guru and author Ewell Gibbons reported the Jewelweed tincture he extracted in alcohol went moldy, but I've soaked fresh Jewelweed in commercial witch hazel extract for a few weeks, and the extract of the two herbs works well and doesn't perish. 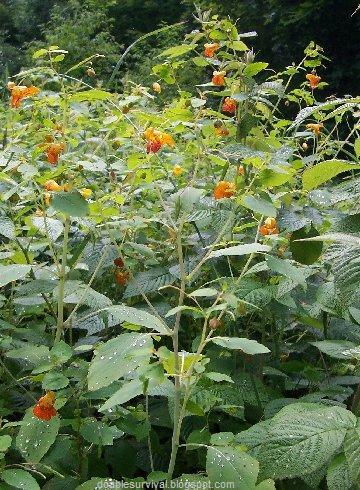 You can also make Jewelweed ointment by simmering a small amount of Jewelweed in light vegetable oil (any vegetable oil except olive oil, which burns) 10-15 minutes. 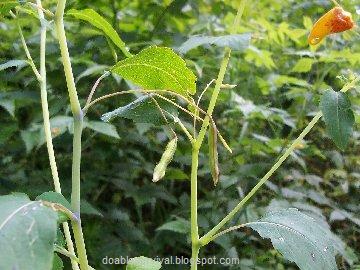 Use only a small handful of Jewelweed stems per quart of oil, or bubbles of Jewelweed juice will form in the ointment and go moldy. Strain out the herb, add a handful of beeswax to thicken it, and heat until melted. Take out a spoonful and let it cool to test the thickness, and add more oil or beeswax as needed. Add the contents of one oil-soluble vitamin E capsule, a natural preservative, and let it cool. Refrigerated, it lasts for months." You may remember these plants as a kid. 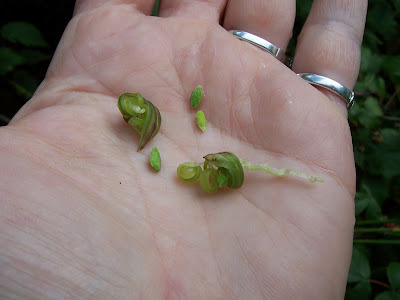 I like to pop the seed pods when they are tense and ready to pop, and the seeds pop out all over the place. I called them "poppers" when I was a kid. By the way, the seeds are edible. This is supposed to work well on burns, like you would use Aloe Vera. Just break open a leaf and rub (gently of course) the liquid on the burn area. I will have to try this next time I burn myself. I'm a klutz, so it's inevitable. ;) It's also said to relieve sores on the skin and snake and insect bites and stings. 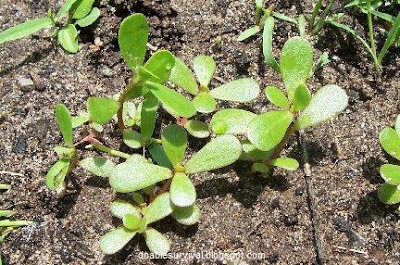 There is a lot of information about medicinal values of Purslane, and I'd like to get into more detail later. 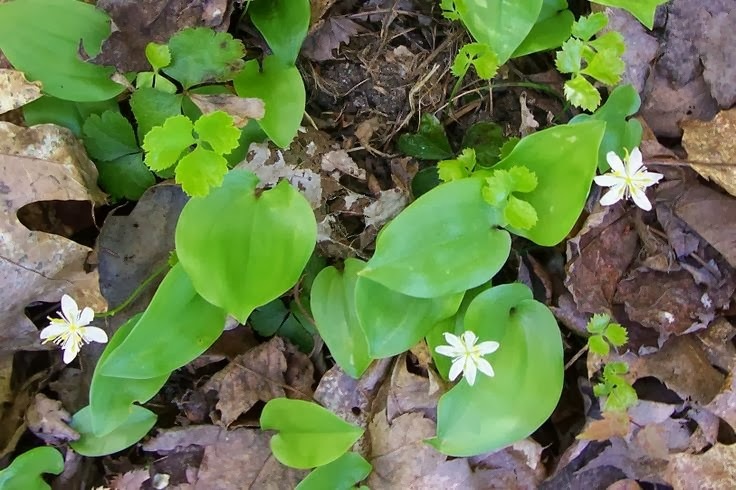 Native Americans have used it for things like earaches, diarrhea, burns, and bruises. This tends to grow wild in gardens and other disturbed areas and is usually pulled out as a weed, but these are edible also. (See my Wild Edibles post.) It's very good for you, full of vitamins and far more omega 3 fatty acids than other plants. Note the three part leaves. are mixed in with them (larger rounded leaves). The whole plant is edible but bitter. It's said to work well for mouth sores. I even heard Les Stroud on Survivorman mention that they are very good for that. 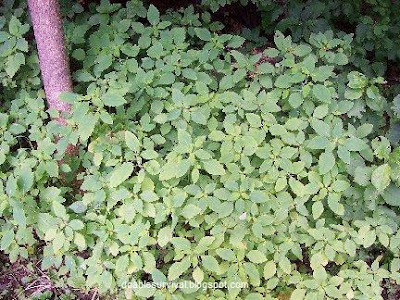 Goldenthread is a very bitter tasting herb that was formerly highly valued and widely used in North America by the native Indians and white settlers alike, though it is little used in modern herbalism. It was employed mainly to treat any soreness in the mouth. The dried roots, stems and leaves are antiphlogistic, highly astringent, sedative, stomachic, tonic. 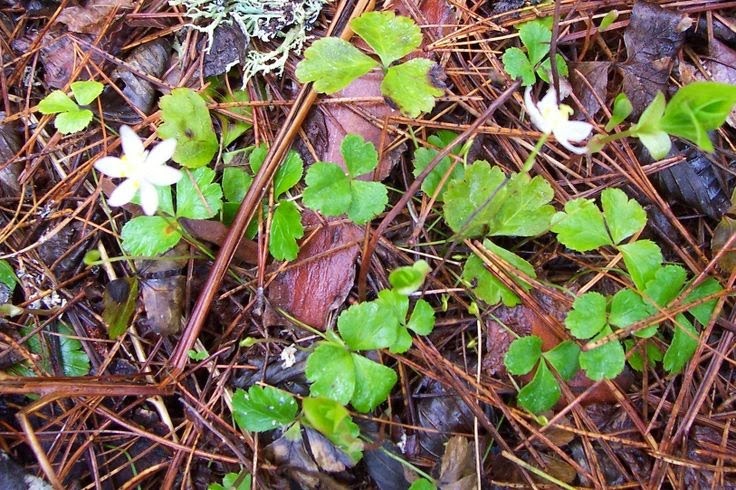 The plant is valued as a local application in the treatment of thrush in children. It is also used in the treatment of ulcerated mouths and as a gargle for sore throats or mouths. It is said to be useful in the treatment of dyspepsia and helpful in combating the drink habit. The plant contains the alkaloid 'berberine', which is a mild sedative, anti-inflammatory and antibacterial. The root is collected in the autumn and dried for later use.